Iraqi Has Returned To U.S. After ICE Deported Him Against Court Orders Muneer Subaihani says immigration agents told him he would be in jail for life if he didn't agree to be deported to Iraq. On Tuesday, in a rare event, he was admitted back into the U.S.
Muneer Subaihani at the airport in Baghdad on Tuesday, waiting to board the first of his flights back to the United States. Muneer Subaihani had lived in the United States for almost 25 years when he was arrested by U.S. immigration authorities last summer and deported back to Iraq. That's when the U.S. lost track of him. Immigration and Customs Enforcement deported him in contravention of a U.S. federal court order two years ago halting the deportations of about 1,400 Iraqis. Subaihani was one of them. In a rare move, the court ordered ICE to find him and bring him back to the United States. Subaihani, 52, arrived back in the U.S. Tuesday night — the first time an Iraqi deportee has been allowed to return, according to the American Civil Liberties Union, which hired a private investigator to find him in Iraq. Last August, ICE agreed to return Subaihani to the United States. But first it had to find out what happened to him after it had put him on a plane, unaccompanied and with no Iraqi identification, to Morocco en route to Baghdad. "ICE lost him in transit. For days they didn't know where he was. It took us several months and a private investigator to find him," said Miriam Aukerman, a lawyer with the ACLU. The nonprofit group launched a class-action suit, Hamama v. Adducci, in June 2017 challenging the ICE deportations. "When we finally found him, we couldn't get him back because ICE had deported him without the documents that you need to show who you are in order to travel," Aukerman said. "So this was our third attempt to get him back and we were quite nervous as to whether it was going to actually happen." Court documents filed by the ACLU say ICE's efforts to follow the court order and retrieve Subaihani consisted mainly of sending emails to U.S. Embassy officials that went unanswered and calling an airline's toll-free customer service number to try to find out whether he had boarded one of his connecting flights. The airline at the time refused to disclose the information. After Subaihani was located, according to Aukerman, the immigration officials' attempts to bring him back failed — once because of his lack of identification and a second time because ICE didn't rebook his airline ticket. ICE spokesman Khaalid Walls said he could not comment on the case because of pending litigation regarding the ACLU lawsuit. "I'm so happy. I can't believe it," Subaihani told NPR Wednesday in Antioch, Tenn., where he was staying with a friend. Subaihani, who had a green card and had lived near Nashville, Tenn., for 15 years, said he planned to try to get his apartment back and to look for work. He was evicted and his belongings were thrown into the street when he did not return from Iraq in December. He had worked in an auto repair shop before being deported. Born in Baghdad, Subaihani arrived in the United States as a refugee in 1994, after two sisters and a brother were killed in a failed uprising against Saddam Hussein in 1991. Subaihani was convicted of marijuana possession in 2002 and 2004, spending about a week in jail each time before he was placed on probation. Following a White House order in 2017, ICE expanded the focus of its arrests and deportations to include noncitizens with any criminal record and even those who had overstayed visas decades ago. The executive order also expanded the authority of individual immigration officers. The agency accelerated detentions, and deportations rose 17 percent in fiscal year 2018 compared with 2017, according to an ICE report. The agency said it targets "aliens who present a danger to national security or a threat to public safety, or who otherwise undermine border control and the integrity of the U.S. immigration system." In June 2017, Subaihani received a deportation order and was detained, then released, and detained again. Subaihani, who has a heart condition and limited reading and writing skills, said while he was being held immigration agents told him he would be jailed for the rest of his life unless he signed a document agreeing to be sent back to Iraq. He signed it and was deported in August 2018. His case was consistent with others who said they were coerced into agreeing to be deported. A federal judge ruled last June that ICE could not threaten deportees with legal consequences for refusing to sign. 'They Know I'm Different': Deportee Struggles In Iraq After Decades Living In U.S.
Iraq's policy is to refuse to accept deportees who do not agree to be sent back. Evidence in the court proceedings revealed that ICE had misrepresented the Iraqi government position to gain approval for the deportations. 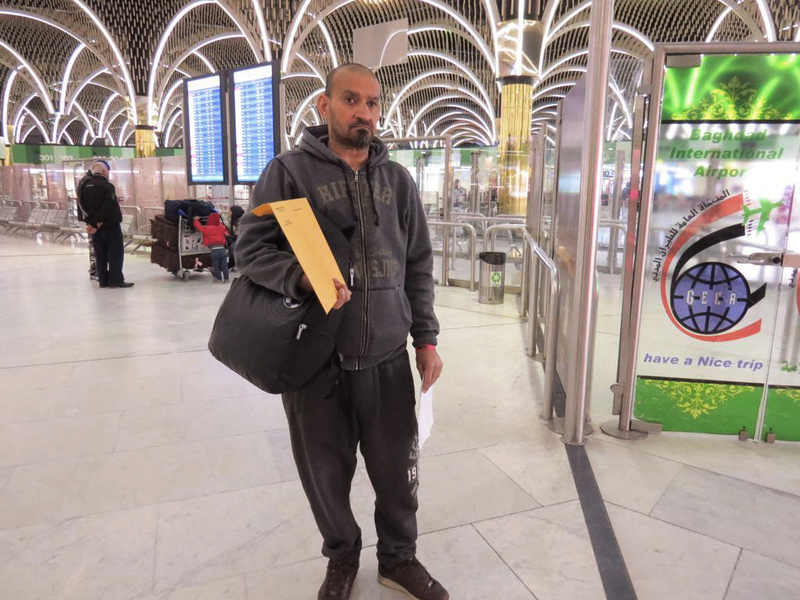 Subaihani was deported Aug. 10 and due to arrive two days later in Baghdad, after changing planes in Morocco and Bahrain. When he landed in Morocco, though, the authorities held him in an airport detention facility for several days because he lacked official documents, he said. "There was no food, no water. I couldn't go outside because I didn't have papers. They treated me like a dog," he told NPR on Tuesday in Baghdad. When he was released and allowed to continue to Bahrain and then to Iraq, he was in and out of the hospital with no permanent place to stay. "I know this is my country, but it's not safe," he said, before boarding the first of his flights back to the U.S. from Baghdad. "I like the United States best — No. 1. I had a lot of trouble here." Lack of Iraqi identification makes it almost impossible to rent an apartment, get public medical care or even navigate security checkpoints without the risk of arrest. "The one-way travel documents that are issued in America by the Iraqi government are good only for that one-way travel to get to Iraq. They become invalid when you land," said Daniel W. Smith, a researcher previously based in Iraq who is cited as an expert witness in court cases on the deportations. He said those applying for identification documents have to travel to the provinces where they or their parents were originally from. "It's precisely that kind of travel through different areas without the ID that you are going to get that can be dangerous," he told NPR. Another Iraqi deportee, Naser al-Shimary, said he is still trying to get identification papers almost a year after the U.S. deported him to Iraq. The federal court in Michigan ordered immigration enforcement officials to notify the ACLU of pending deportations of members in the class-action suit. Instead, the civil liberties group said it learned of Subaihani's deportation 10 days after the fact, after noticing he was not on a recent list of detainees. ICE then acknowledged it had deported him but did not know whether he had made it to Iraq. "We were really worried that, given that he was deported without adequate ID, we would not be able to get him back," ACLU attorney Aukerman said. In December, a federal appeals court overturned the U.S. district court ruling that had halted the deportations of Subaihani and the roughly 1,400 Iraqis, saying that court did not have the jurisdiction to make the ruling. That new order has not yet gone into effect and is expected to be challenged.